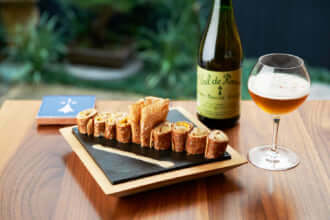 Although he moved to France over 30 years ago, Akihiro Horikoshi’s tiny, humbly decorated French restaurant in the 7th arrondissement evokes a quintessentially Japanese feeling. The only other employee at the 16-cover Table d’Akihiro is the lady serving the guests. Having worked for nearly 20 years at the 3 Michelin starred gastronomy temple L’Ambrosie in Paris, chef Akihiro specializes in classic French cuisine with a focus on top quality fish and seafood. Whether it’s ‘crispy red mullet with carrots and cumin’ or ‘sole with salsify and meat jus’, the menu changes daily and everything is cooked à la minute. The sauces are perfectly made but never too heavy, and the cooking of the seafood is always spot-on (or ‘just cooked’ as chef Aki says). 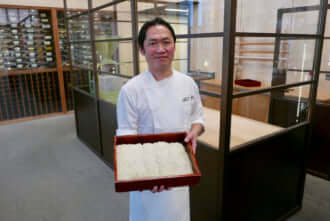 Akihiro Horikoshi is known for being a very private person, but if you become a regular client and if he likes you enough, you can pre-order special dishes with caviar or truffles, including his versions of l’Ambroisie classics.